There was more than one manufacturer of the star head nails I believe, but DB Gurney still makes them. They've been making specialty copper and brass fasteners for close to 200 years. Gurney's fasteners have made it all over the country. We've done work in a number of states and found this type of nail. Certain companies back in the day used to put a stamp of some sort on the head. I am working on restoring a historical home in Colorado Springs, CO with the same stamping on the nail heads. Any luck locating the manufacturer? It wouldn't surprize me if the makers used a special logo, but I can't tell you for sure. 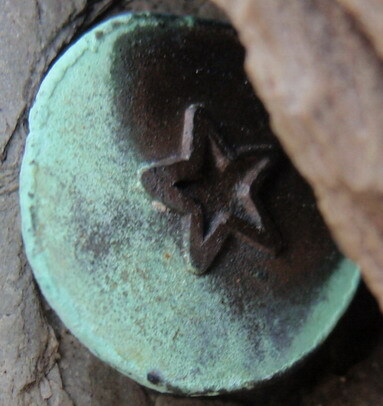 I have seen a lot of the slate nails with the star on them doing repairs. I haven't bought any new ones with anthing but a smooth surface, and I have been using copper nails for about 30 years. No help here. I have seen many slate roofs with 'pictures' on the copper nail head, and now i am in a litigious situation and need some back-up. Old-timers have told me that the pictures could be traced to a year and possibly a manufacturer. I am trying to date a slate roof with stars on the nail head, see attached photo. I have also seen hammers, and what appears to be Sagittarius on nail heads. I have seen the star on roofs at Yale in New Haven, and other figures on other roofs in the metropolitan NYC and suburbs. Can anyone tell me if these can be traced back to a year or a maker?